A 25,000 square foot masterpiece set on Lincoln Park’s finest street and what was once the most expensive property available for purchase in all of Illinois has reportedly been taken off the market. There is still an active listing on Sotheby’s International Realty. The palatial residence sits on an enormous estate property measuring 117 feet x 149 feet, totalling more than eight city lots. It was built for Richard Parrillo and his wife, Michaela, nearly a decade ago after purchasing the building lot for $12,500,000. The Chicago Tribune reported that the couple spent $65,000,000 building and finishing the grandiose home. Every step has been taken to provide complete privacy and tranquility, including manicured grounds, fountains, a reflecting pool and a hand-forged antique garden pavilion. Grand in every way, but not overwhelming, the design is perfect for large scale entertaining as well as intimate everyday living. There are six bedrooms and eleven bathrooms throughout. 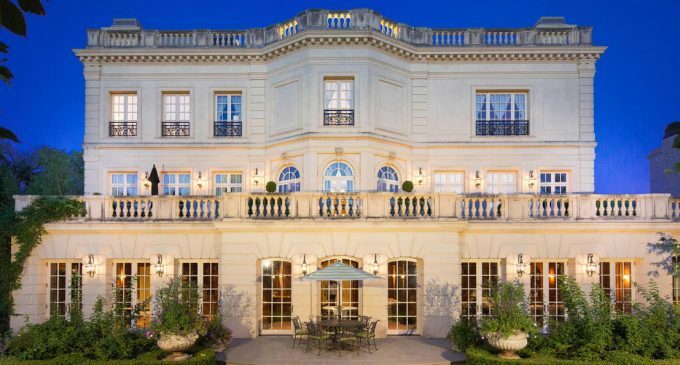 It was on the market for $50,000,000 with Sotheby’s International Realty.